Updated to include earnings from Best Buy. 1. -- U.S. stock futures declined sharply on Tuesday, Aug. 29, European stocks sank and Asian shares traded mostly lower after a North Korea missile launch raised military tensions in the region. North Korea's latest missile test -- the first to fly directly over Japan since 2009 -- rattled investors and sent regional markets tumbling, with Japan's Nikkei 225 falling 0.45% as the yen touched an April high of 1.0833 against the greenback amid significant flows into safe-haven assets. Gold prices on Tuesday gained the most in more than three months in early European trading, taking the price of the bullion past $1,300 per ounce and near to highest level since the U.S. presidential elections in November. Gold has gained more than 10% since early July as investors move cash into traditional safe-haven assets amid the rising military and political tensions in Asia following a series of missile tests by North Korea. U.S. stocks on Monday, Aug. 28, closed mixed as insurance and energy industries grappled with the fallout of Tropical Storm Harvey's devastation in and around Houston. For Tuesday, the economic calendar in the U.S. includes the S&P Corelogic Case-Shiller Home Price Index for June at 9 a.m. ET, and Consumer Confidence for August at 10 a.m.
2. -- Tropical storm Harvey's devastating flooding has taken almost 17% of U.S. refining capacity offline and about 10% of crude production, creating an imbalance that is likely to lead to larger U.S. crude inventories and weigh on crude prices. West Texas Intermediate crude oil futures for delivery in October fell 0.13% on Tuesday to $46.51 a barrel. Futures for benchmark Brent crude fell 0.37% to $51.24 a barrel. 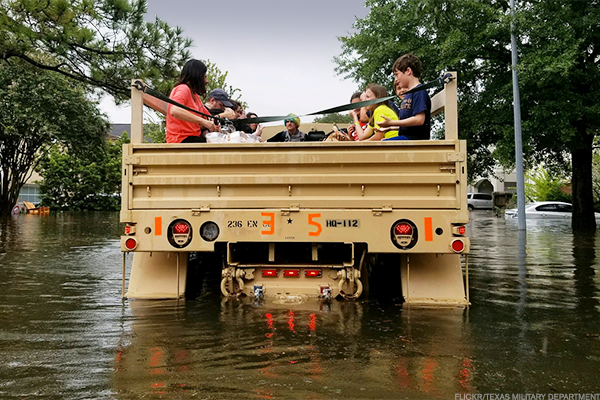 Much of the U.S.'s refining capacity is located in the coastal region of Texas where the storm made landfall on Sunday night and where flooding has been worst. The storm is expected to lash the Gulf of Mexico's coast on Tuesday with the National Hurricane Center predicting as much as 50 inches of rain in some regions, contributing to "ongoing catastrophic and life-threatening flooding from Texas to Louisiana." "Data available so far point to Harvey significantly disrupting refining in Texas with nearly 3 mb/d of capacity offline. This represents 16.5% of the 18.2 mb/d of U.S. capacity," Goldman Sachs analysts wrote in a note. "Should these levels of outages remain in place, and using past hurricanes as proxies for the impact on oil demand, we roughly estimate that the impact of Harvey on the U.S. oil market would be to add 1.4 mb/d of crude while removing 615-785 kb/d of gasoline and 700 kb/d of distillate." Exxon Mobil Corp. ( XOM - Get Report) said one of its oil refineries near Houston was damaged during the storm and the company warned that chemicals could be released into the air, CNN reported. Exxon said a roof at the facility in Baytown "partially sank" because of heavy rain. A report filed with Texas environmental regulators said Exxon expects air emissions linked to the damage will end by Friday at the facility. Exxon shut down the refining and chemical complex and said it was taking action to "minimize emissions." Exxon shares fell 0.4% in premarket trading on Tuesday. Meanwhile, Chubb Ltd. ( CB - Get Report) , Travelers Cos. ( TRV - Get Report) and other insurers could face as much as $20 billion in losses from Hurricane Harvey, as extensive flooding in the Houston area leads to big claims on commercial-property policies, JPMorgan Chase & Co. said on Monday. 3 . -- Apple Inc. ( AAPL - Get Report) CEO Tim Cook collected 560,000 shares, half of them linked to the company's performance and the maximum allowed under the iPhone maker's long-term compensation program, a regulatory filing on Monday showed. The award was worth $89.2 million when it was granted on Thursday, Aug. 24, based on Apple's $159.27 closing price, Bloomberg reported. Cook received the performance-linked stock because Apple shares outperformed at least two-thirds of businesses in the S&P 500 over three years, according to the filing. It's Cook's fourth consecutive payout at the top threshold, according to Bloomberg. Apple on Monday confirmed that Sept. 12 will be the official launch party for its much-anticipated iPhone 8 release. 4. -- Renault S.A. ( RNLSY and Nissan Motor Co. ( NSANY said they will develop electric cars with a Chinese state-owned partner. The venture, Dongfeng Motor Corp., aims to develop a vehicle based on an SUV platform shared by Renault and Nissan, the companies announced Tuesday. Production is due to begin in 2019, the Associated Press reported. Global automakers are investing heavily to develop electric vehicles for China, responding to rising demand. According to the AP, sales of pure-electric and gasoline-electric hybrids in China rose 50% last year over 2015 to 336,000 vehicles, accounting for 40% of global demand. By comparison, U.S. sales totaled 159,620. 5. -- Best Buy Co. (BBY - Get Report) earned 69 cents a share on an adjusted basis in the second quarter, topping forecasts of 63 cents. The electronics chain also raised revenue and operating earnings guidance for fiscal 2018. The stock rose 3.5% in premarket trading. Hain Celestial Group Inc. (HAIN - Get Report) and H&R Block Inc. (HRB - Get Report) are also expected to issue earnings reports on Tuesday.